Food plays a very important role in our Zarathushti psyche. We create all varieties of food for different occasions; special food for happy occasions and we also have food for the dead in our religious ceremonies. In the Summer, 2011 edition of the FEZANA Journal, Sarosh and Benafsha Khariwala together with Arnavaz Chubb, all in Melbourne, Australia, explored the concept of “Food as Our Identity”. They did a superb job in soliciting articles for the meaning of food in our various rituals, of finding Zarathushti chefs from around the world who graciously shared their prize recipes. Farishta Murzban Dinshaw took their work to the next level, collecting recipes from Journal readers and using her love of history to add the cherry on the top. We thank Farishta for undertaking this project with such dedication and love. We offer the gift of this book to all Zarathushtis who are interested in good food as we celebrate FEZANA’s silver jubilee this year. We invite you to relish the experience and the taste as you read the articles and try the recipes. This book has 72 recipes, which is just a sampling of Parsi and Persian dishes. The recipes have been contributed by readers from Australia, Britain, Canada, India, Iran, Pakistan and the United States of America. Some recipes have been edited to fit the page, but I have tried to maintain the voice of the contributor as far as possible. For this reason, you may see that spellings of non-English terms vary and have not been italicized. Some people might wish that there had been photographs to accompany the recipes. It was a conscious decision to make this a text-based publication so that it would be faster to download and save toner ink when printing. For more recipes, including quintessential ones like Patra ni Machi (Fish in Banana Leaves) or Khoresht Fesenjan (Pomegranate and Walnut Stew), visit websites like www.parsicuisine.com and www.mypersiankitchen.com. This publication is dedicated to my father, late Murzban Nadirshah Dinshaw, whose appetite for good food was as large as his heart – Daddy, I miss you every time I have rumble tumble on toast. Farishta Murzban Dinshaw has a Masters degree in institutional food management from the University of Karachi, Karachi, Pakistan. She enjoys eating more than cooking, and revels in the diverse ethnic cuisines available in Toronto, Canada, where she lives. Her interest in Zarathushti history and religion began at age fifteen when she started volunteering at the Friday School for Little Zarathushtis, Karachi. She has presented papers on Zarathushti religion at several congresses, including the World’s Religions after September 11 Congress, Montreal in 2006. 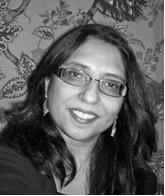 Farishta is a regular contributor to the Fezana Journal and Hamazor. She is also the author of Discovering Ashavan, a story set in ancient Iran about a young boy befriended by Zarathushtra.